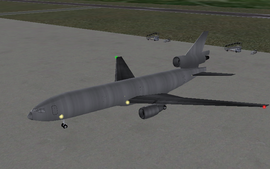 This feature is scheduled for FlightGear (unknown). The McDonnell Douglas DC-10 is a three-engine medium- to long-range widebody airliner, with two engines mounted on underwing pylons and a third engine at the base of the vertical stabilizer. 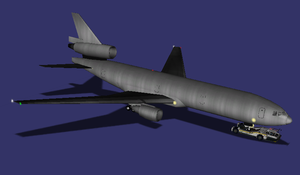 The most common model, built with General Electric CF6-50 turbofan engines and larger fuel tanks to increase range and fuel efficiency, as well as a set of rear center landing gear to support the increased weight. It was the second long-range model after the -40 and very popular with European flag carriers. Produced from 1972 to 1988, the DC-10-30 was delivered to 38 different customers (163 built). 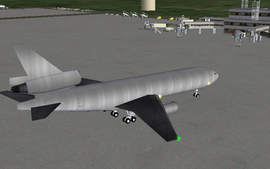 The aircraft development was started at 31/01/2010. Isaías V. Prestes, isaias at gmail dot com. McDonnell Douglas DC-10. Published by Wikipedia. This page was last modified on 15 April 2012, at 10:09.